Place all ingredients except tartar sauce in food processor. Cover and process, using quick on-and-off motions, until fish and shrimp are coarsely chopped. Spray 12-inch nonstick skillet with cooking spray; heat over medium heat. Drop fish mixture by scant 1/3 cupfuls into skillet; flatten with spatula. Cook 4 minutes; turn. Cook about 4 minutes longer or until patties are firm. Serve with tartar sauce. 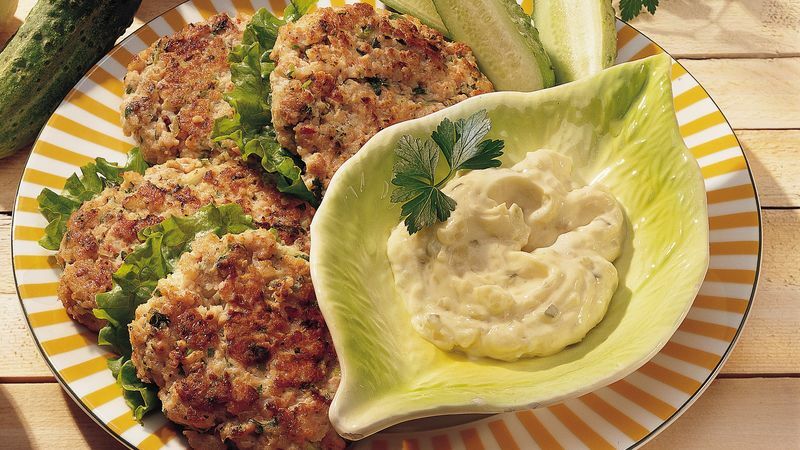 This take on the classic crab cake can be eaten as is or served on buns with reduced-fat mayonnaise, tartar sauce or salsa.